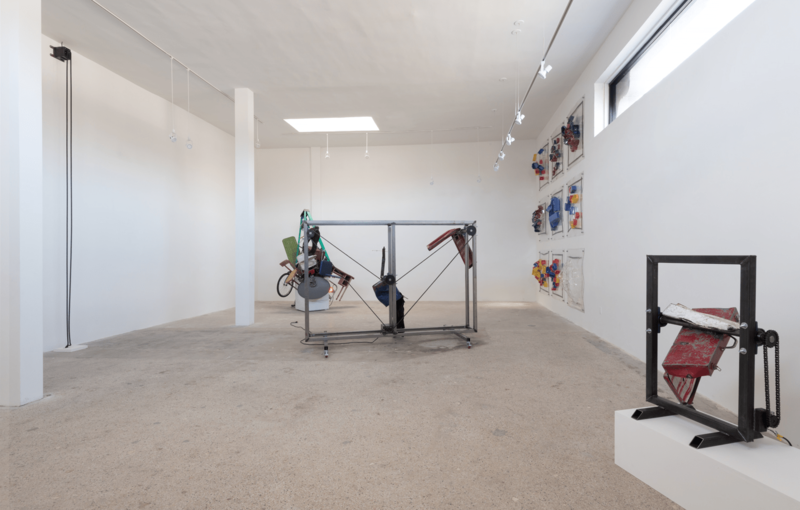 Stephen Neidich: not necessarily necessary (2017) (installation view). Image courtesy of the artist and ltd Los Angeles. 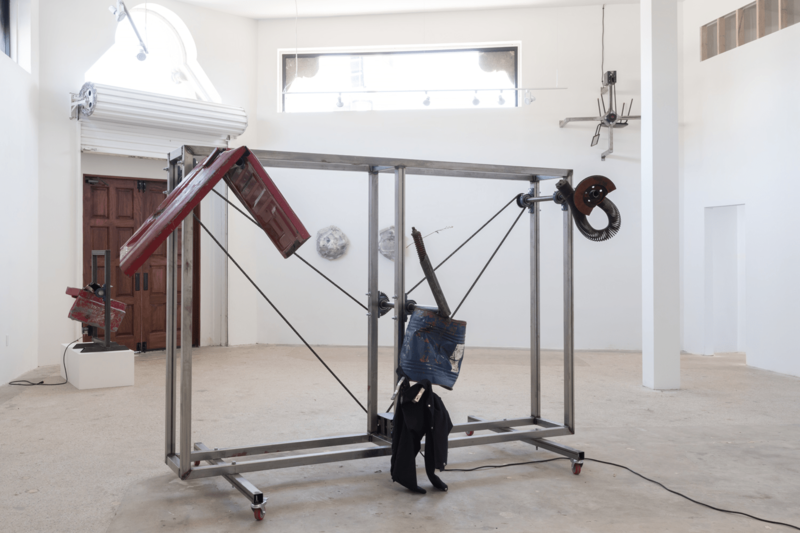 Comprised of a panoply of dejected industrial tools and rusted metal objects, the motley sculptural contraptions that constitute Stephen Neidich’s exhibition not necessarily necessary find their succinct meaning within the context of the exhibition’s title. While not necessarily necessary, Neidich’s junkyard aggregations suggest a formal schema of their own internal logic, as if to thwart being categorized as aesthetically unnecessary. 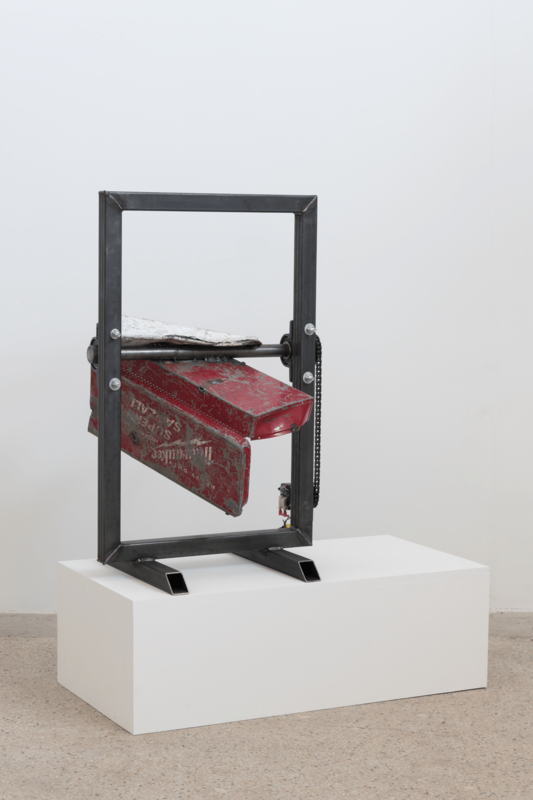 Variously quiescent and kinetic, these sculptural apparatuses both mime the aesthetic tropes of the formal art object, and dramatize the motorized machinations of the toolbox tinkerer. 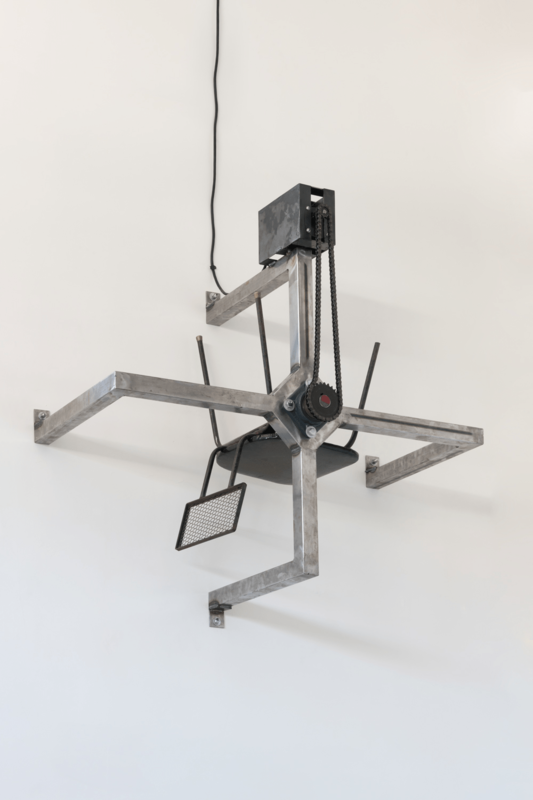 Whether inert or animate, Neidich’s work co-opts the tools and trappings of industrial labor and decommissions them, choosing instead to aestheticize their kinetic capabilities. 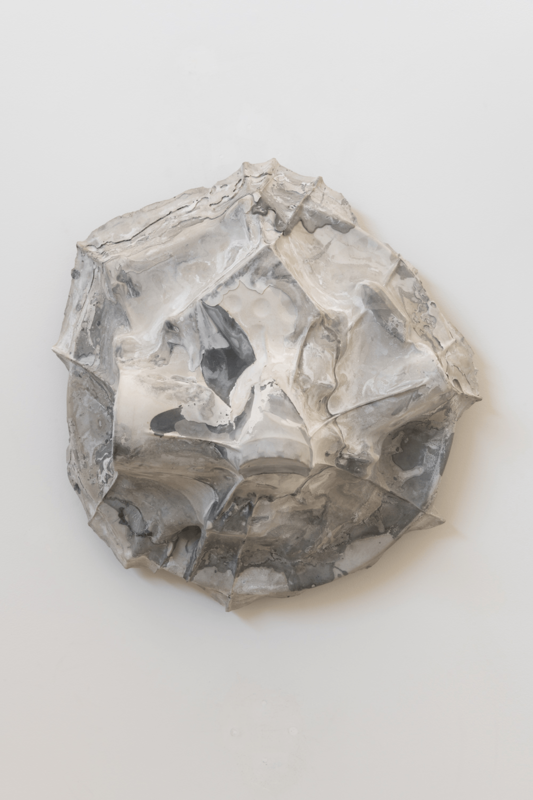 Blanched of obligation, each discrete work enacts its self-anointed function, consciously performing as either a de-facto work of art, or as a haptic totem to the artist’s vernacular material impulses. Aurally reinforcing these performative undertones, several mechanically automated sculptures (Milwaukee, Old .45, and Chevron, all works 2017) elicit a chorus of phonic murmurs—metallic gasps, sighs, and heaves that echo throughout the space and anthropomorphize the sculptures’ twisted, assemblage-like components. 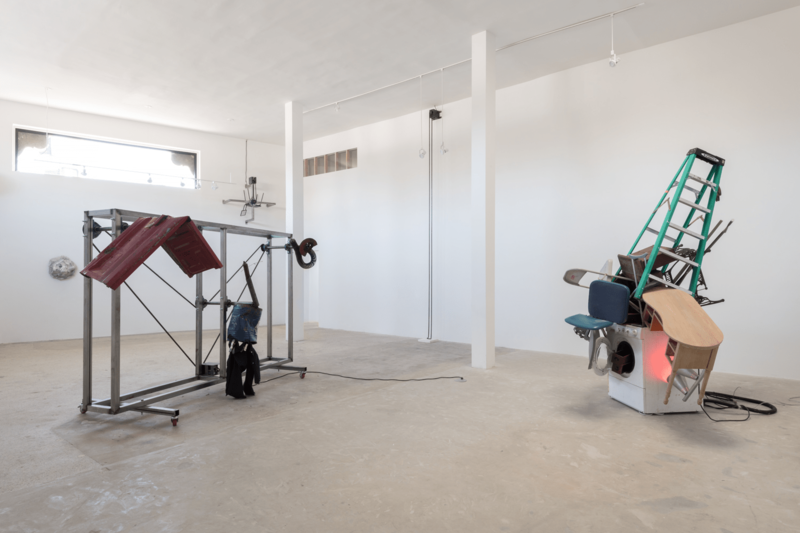 In Chevron, the inclusion of the artist’s welding jacket reflexively posits the sculpture as a surrogate for the artist’s role in the performance of creative labor. 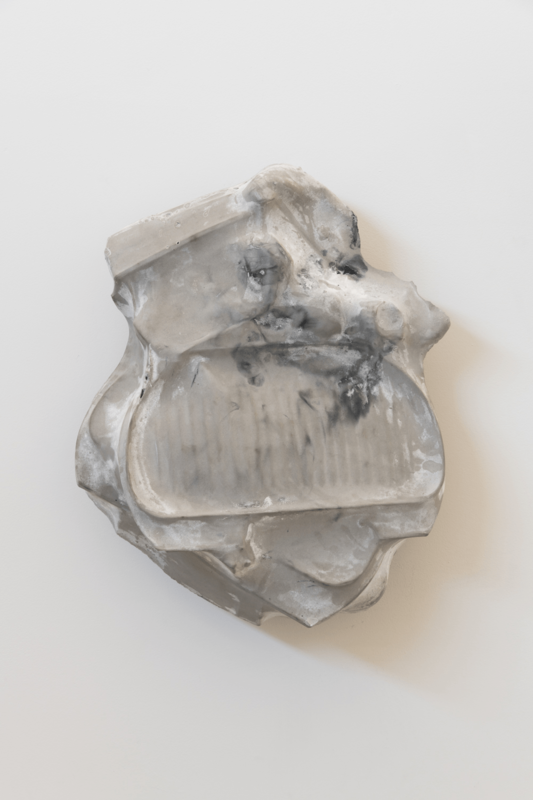 In Marble Kicks, as well as the Ironton series, disjointed material scrapings are instead dormant, either entrapped in vacuum-formed plastic or calcified in marbleized plaster, like unwitting victims of a post-industrial Medusa. 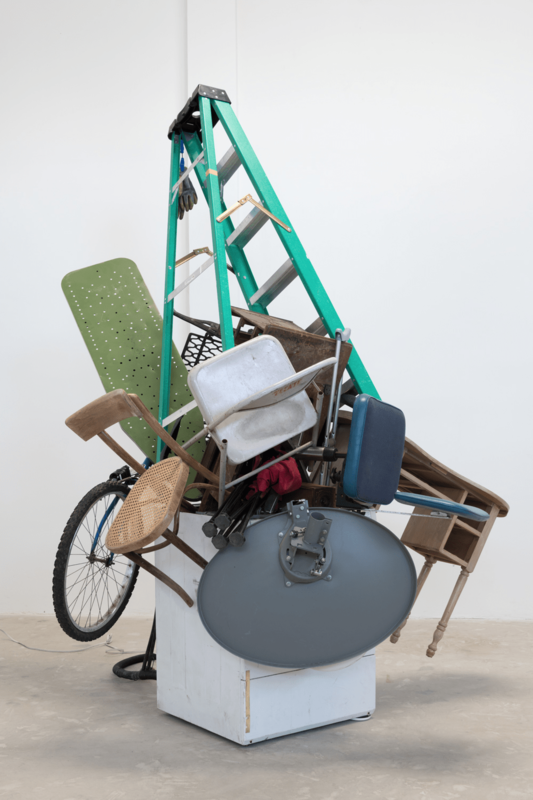 While a work such as Still Truckin offers a compelling moment of poetic subtlety, the exhibition at times precariously veers towards a hyper-masculine, grease-and-galvanized-steel aesthetic. It also roguely eschews adherence to any specific theoretical framework, bypassing potential critical inquiries into whether the work of art, for instance, is an index of labor. Rather, these vernacular tools are incorporated into the artist’s personal arsenal and deployed for his tangible enjoyment, of which the viewer becomes a witness. As such, Neidich’s mechanized sculptures seek, and find, myopic material pleasure in the process-laden performance of necessitating the unnecessary. Stephen Neidich: not necessarily necessary runs September 21–October 28, 2017 at ltd. los angeles (1119 S. La Brea Avenue, Los Angeles, CA 90019). Stephen Neidich, Can You Hear Me Now (2017). Mixed media, 79 x 85 x 104 inches. Image courtesy of the artist and ltd Los Angeles. Stephen Neidich, Old .45 (2017). Chair with vinyl seat, steel, #40 roller chain, and 1018 cold roll steel shaft, 48 x 32 x 18 inches. Image courtesy of the artist and ltd Los Angeles. Stephen Neidich, A 4 Loco explode in Dyson’s Studio (2017). Plaster and iron shavings, 16 x 23 x 10 inches. Image courtesy of the artist and ltd Los Angeles. Stephen Neidich, Milwaukee (2017). Steel frame, used Milwaukee tool box, #40 roller chain, and pillow mounted ball bearings, 50 x 37 x 32 inches. Image courtesy of the artist and ltd Los Angeles. Stephen Neidich, Marble Kicks (2017). Plaster and iron shavings, 20 x 21 x 13 inches. Image courtesy of the artist and ltd Los Angeles.